Imagine someone trying to sell you a new car without a radio. Or a new smartphone without a camera. When it comes to these physical products, we’re buying a bundled set of different technologies. Value is created by pulling once disparate things, together in one place. For software, the dynamic is different. There are periods when bundling is essential to software products. And there are times when unbundling brings with it greater opportunity. Right now, with the rise of bots and messengers, rebundling software services can create a new wave of distribution opportunities. Bundling has long been the fuel of technology innovation. iTunes unbundled the music CD into individual tracks rather than albums. Spotify rebundled music into an unlimited plan. Early internet services like Excite and AOL bundled news, email, shopping, and weather. iOS and Android unbundled them again as single-purpose mobile apps. 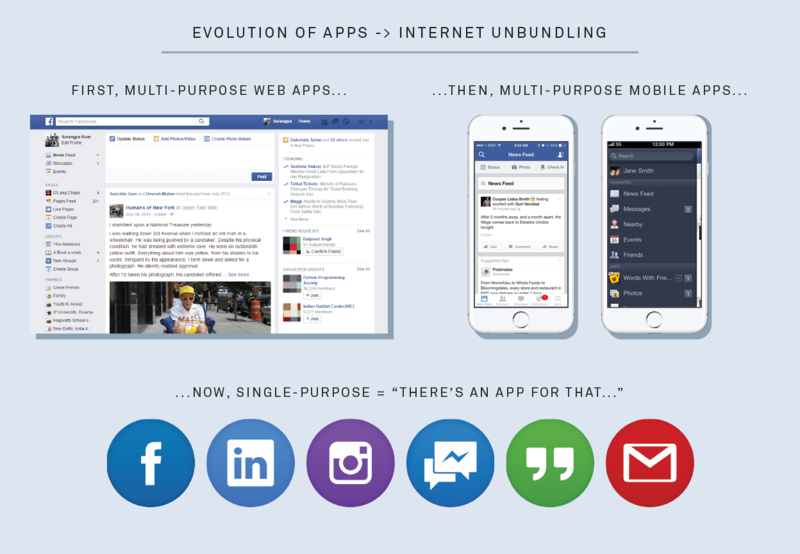 Facebook epitomises this cycle of unbundling and rebundling. Their initial focus was on providing multiple web services in one package – content, sharing and messaging. But how we use the web changes fast. Smartphones showed us that single purpose apps could be massively successful. Facebook spotted the opportunity early when it started “unbundling the big blue app”. Mobile unbundling makes sense from a user experience point of view – a bloated web app just doesn’t work on mobile. But it can also make sense from a business perspective. When Facebook unbundled Messenger, they drove distribution to their newer, unbundled app. It gave them another icon on the homescreen, and another draw on users’ time, attention and usage. As Mark Zuckerberg said, unbundling Messenger allowed them to explore “new areas that we didn’t have the room to do before”. The likes of FedEx, Everlane and Giphy are quickly filling in these new areas in Facebook Messenger. An unbundled mobile app is being “rebundled” with lightweight, contextually relevant, micro-services from third party platforms. When you take a look at what’s happening in the new world of mobile distribution, rebundling services makes a ton of strategic sense for everyone involved. Bosch might be best known for selling washing machines and other domestic white goods. Yet 60% of their revenue comes from selling car alarms, car radios, and spark plugs. Bosch have grown their automotive business faster than any other segment – without making a single car. Sony is well known for building their own smartphones. But double the size of its smartphone business are the third party cameras it provides for Apple. Every iPhone sold earns Sony $20 – each one contains a Sony camera. The benefits in these relationships are mutual. The “containing” technology gets a simplified manufacturing line, while the small mechanical or electronic devices – widgets – get the scale marketing and distribution of the product they’re embedded in. In early mobile services, these sorts of relationships simply weren’t possible. But thanks to both deep linking and app extensions, these apps within apps type relationships are on the rise and set to become the norm. Let’s take a real example, using Facebook, Shopify and Stripe. In the below example, all parties are gaining from having their services live within another. Shopify offer Facebook, Twitter, and Pinterest’s mobile audiences as potential buyers of products. For Shopify, offering the reach of three of the biggest social networks as part of a bundle makes mobile marketing significantly easier for their merchants. The reach of billions of potential customers is already built into their product. For Facebook, Twitter, and Pinterest, the benefits are clear too; being part of a bundled offering creates a new distribution channel for their mobile advertising products. Meanwhile, Stripe offer their payments service to Shopify merchants as “Shopify Payments”. For Shopify, bundling complementary services together gives merchants a much shorter and obvious path for mobile payments. For Stripe, being bundled into Shopify creates a significant global distribution opportunity for their payment services. Through this symbiotic relationship, Facebook, Shopify and Stripe have created new value for customers, and new distribution opportunities for each other. Online businesses can reach relevant audiences (Facebook), send potential customers to a high quality destination (Shopify), and use transaction data (Stripe) to create relevant targeting for remarketing campaigns back on Facebook. It’s a virtuous cycle of value exchange which continuously reinforces the value of each individual service. The cyclical nature of bundling means the real value is found not at the end state, but in the process of change. 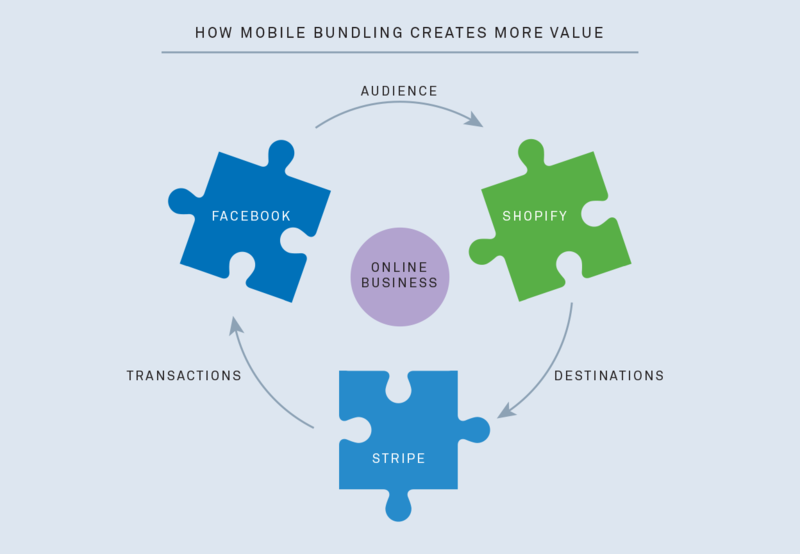 Small changes in technology can tilt the balance in favor of bundling or unbundling. When the balance is still shifting, a window of opportunity opens. Currently the popularity of messaging interfaces and bot platforms are creating this window. Unbundle your product. Create a programmatic interface. It’s the ‘I’ in API. Build it, document it, use it. Rebundle your product with others. Make the first move. Connect your product with others through tight integrations and connected APIs. Create distribution opportunities through partnerships. SaaS marketplaces and bot ecosystems are the new app stores. Make the most of the scale of these products to grow yours. Define new monetisation models. No free tier or free trial? Create one. Complex pricing? Create partner or bundle specific pricing. Retain, learn, and scale. Fight to make new users successful. Learn from them, and scale bundling initiatives to other complementary platforms. Embedding your product within another might seem like the last thing any product manager would want to do. Being at the mercy of marketplaces might feel counterintuitive. But partnerships and integrations with emerging platforms can reap rewards that far outweigh the risk. We’re entering a new wave of value creation on mobile – if you don’t consider and execute your rebundling strategy you won’t be able to make the most of it.